(NewsUSA) - More than ever, homeowners are appreciating the added value - aesthetic and monetary - that hardwood floors bring to a home. "They also offer what can be an overwhelming variety of possibilities and choices," says Linda Jovanovich of the American Hardwood Information Center, www.hardwoodinfo.com. "Here's a look at five top flooring trends that will help if you can't see the wood for the trees." "There's a growing demand for American-produced hardwoods," says Michael Martin, President and CEO of the National Wood Flooring Association. "It's part of the general trend toward locally-sourced materials of all kinds in the U.S."
Consumer concerns about sustainability, quality, safety, and environmental factors are more easily addressed when a hardwood is domestically grown and milled. Plus, the U.S. offers an unrivaled range of readily available species suitable for flooring. Gray is a classic "neutral" that's never truly out of fashion. It's currently one of the most popular colors, ranging from pale smoke to deep charcoal, showing up on hardwood flooring. "Whether light or dark, gray stains bring out any wood's natural grain and texture," says New York interior designer Laura Bohn. "Grays are versatile and timeless - quiet and soothing colors that recede into the background without losing personality or becoming faceless. They work in any style décor, yet always look modern." For several years, the trend was toward characterful woods like hickory, but recently, white oak has moved to the front. Along with abundance, durability, and reasonable cost, white oak offers aesthetic advantages. "It can be stained light, dark, or somewhere in between," says interior designer Emily Morrow Finkell, CEO of Emily Morrow Home. "Many of the popular gray-brown shades look especially sophisticated applied to white oak. Consumers see and love it in magazines and websites, making it a perfect 'attainable home upgrade.'" "It's all about wide, wider, widest!" says NWFA's Michael Martin. "Planks of up to 7 inches in width are considered normal now. Traditional strip flooring still remains popular, but wide-plank is the market leader." As Melissa Morgan of M Interiors in San Antonio says, "Wider floorboards can make a space look larger and more modern. The floor can be treated like a canvas: ebonized for a sleek, dark look; light-stained for an urban vibe; distressed for a rustic affect - the possibilities are endless." "One way to set your home interior apart is by tapping into the trend for herringbone-and- chevron-pattern hardwood floors, which show up increasingly in decorating magazines," says Morrow Finkell. But as Michael Martin points out, "Since installing herringbone floors is a time-and labor-intensive process, they're more common in high-end projects than in the average middle-class home." Still, if you can afford to splurge, these floors are a gorgeous addition to any room. Visit www.hardwoodinfo.com for more about residential design trends and other applications and products using American hardwoods. 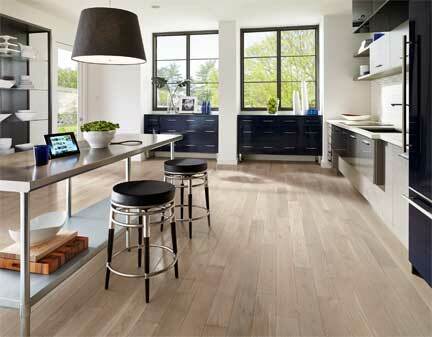 A contemporary kitchen with Mystic Taupe white-oak, solid-plank floors by Armstrong Flooring.